WMAF schools may continue to use their own training curriculum, patterns and testing requirements. There is no need to change your methodologies as long as you adhere to WMAF testing procedures and rank certification. National, and International Rank Recognition. Reviewing and granting of ranks. Access to WMAF Rank Examination and Certification. A central filing of all ranks and styles. Recognition of your rank and authentic ranks of foreign countries. Official WMAF Certificate of Rank and a Rank and Identification Card. All too often Individuals, Instructors, Masters, Grand Masters and even Organizations become involved in martial arts politics. This only causes confusion, disunity, and fragmentation amongst practitioners. The WMAF is a "non-political" organization focusing on the Art and not on the political games played by so many of organizations. 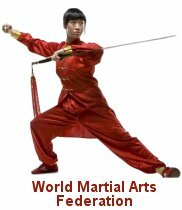 Maintaining the integrity of the Martial Arts and upholding the traditions of these arts.